This is a very rough sketch that I have done for a commission I am working on. The images have been pulled from several sources, cottage images of the lake, the cottage walls and my client's dad playing the piano. 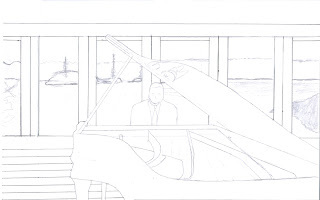 The rough sketch was scanned and the lines darkened in photoshop so that it is easier to see online. I have filled in bit of the dark and light values just to make it easier to see the different dimensions. The lines will be measured and drawn out with a t-square to ensure that they are straight. 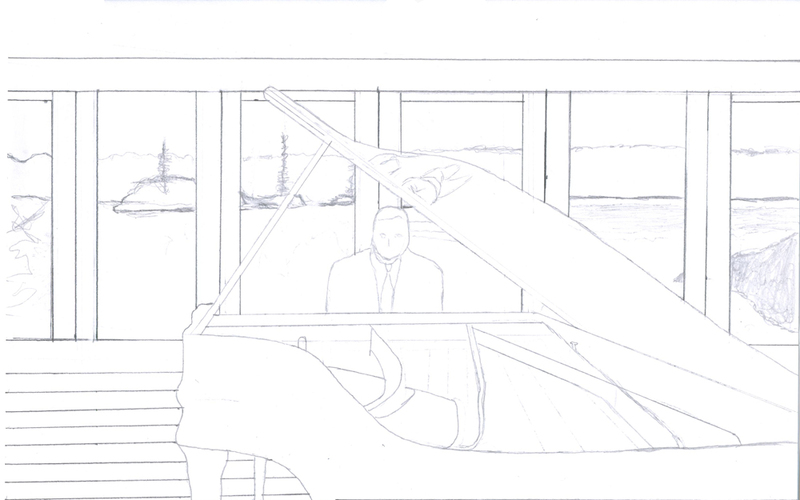 The piano will be the darkest value with the background trees and his coat jacket slightly lighter. There will also be reflections in the water of the trees which will look really nice once completed and will help add even more dimension to the piece.